Welcome to the PPS membership page. If you are interested in becoming a member of the Society, please have a look through the following documents. The majority of PPS members are paediatric and/or perinatal pathologists; however, membership is open to any individual with an interest in paediatric, developmental and perinatal pathology. Consultant grade or equivalent pathologists who spend more than 50% of their time in paediatric or perinatal pathology are required to become Full members of the Society. Full membership is also open to consultants who spend part (<50%) of their time in paediatric or perinatal pathology and to specialists in allied disciplines and scientists working in relevant fields. Individuals pay a full subscription and have full rights to vote and hold all grades of office in the Society, and submit and /or sponsor abstracts for presentation at scientific meetings of the Society . Full members are obliged to subscribe to the journal if they are resident in Europe. Full members resident elsewhere may subscribe to the journal through another IPPA Affiliated Society (e.g. SPP, ANZPPG, SLAPPE and JSPP). Consultant pathologists who spend less than 50% of their time in paediatric pathology and individuals who are not paediatric pathologists but whose work is very closely associated with our discipline (e.g. development al biology, genetics, oncology, biochemistry, paediatrics, epidemiology etc) may opt to take Associate Membership. Associate members pay a reduced subscription. They have the right to vote and sit on committees without the right to hold executive office (President, Secretary or Treasurer). They may be consulted for their views on issues, receive the Newsletter and other correspondence and may attend meetings without having to be sponsored. Subscription to the Journal is optional. Individuals who are in training to become paediatric pathologists are eligible for this category of membership. They pay a reduced subscription but have no voting rights or right to hold any form of office. They may be consulted for their views on issues, receive the Newsletter and other correspondence and may attend meetings without having to be sponsored. As with Associate membership, subscription to the Journal is optional. 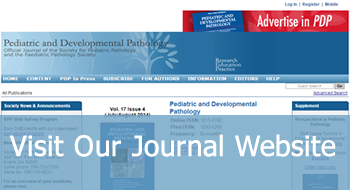 When members retire from their posts they can request Emeritus membership with or without PDP journal subscription. Emeritus members do not have to pay membership fee but have to renew their membership each year through the website (paying £1 via PayPal). We also now have a donation facility for those who wish to make a donation to the PPS. How to pay your membership fees from within the website. Membership fees are due annualy from the 1st of December. To renew your membership simply log in to the website, hover over the 'My Account' tab and select 'My Membership' from the dropdown. From here you will be presented with all your membership information, type of membership, journal subscription, cost etc. You will also be given all the information on the various ways you can pay, these are via PayPay, electronic transfer or standing order.